Many omnivorous diets include chicken and fish. Chicken breasts and tuna steaks both provide a relatively mild flavor, and make for excellent entrees consumed on their own, or as an additive or topper to stir fries, casseroles and salads. Both foods also provide a number of nutrients, though skinless chicken breast and tuna steak differ in they amounts of different nutrients they contain. Both skinless chicken breast and tuna steak help provide your body with energy via their calorie content. A 100 g serving of skinless chicken breast provides 114 calories, while an equal serving of bluefin tuna steak provides 144 calories. When cooking chicken breast or tuna, oil-free cooking methods like grilling allow you to cook without adding extra calories. If you do wish to use oil during the cooking process, choose heart-healthy oils that contain unsaturated fats like olive oil. Protein accounts for a large portion of the calorie content of both skinless chicken breast and tuna steak. 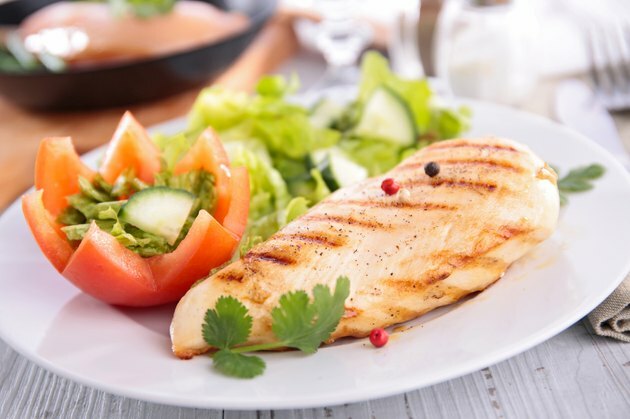 Each 100 g serving of chicken breast contains 21.2 g of protein, which is approximately 74 percent of the total calories in the dish. A serving of tuna steak contains 23.3 g of protein, which is approximately 65 percent of the calories in the fish. Both tuna and chicken provide complete protein, meaning they each contain all 10 amino acids required as part of your diet. Tuna steak and skinless chicken breast both contain some fat, although the fat content varies between the two dishes. A 100 g serving of tuna steak and skinless chicken breast contain 4.9 and 2.6 g of fat, respectively. However, tuna steak contains omega-3 fatty acids, which are not found in the chicken breast. These fats contribute to the health of a number of tissues, including your brain and heart, explains the University of Maryland Medical Center. If you’re looking to consume more omega-3 fatty acids, select tuna steak over chicken breast. Skinless chicken breast and tuna steak also both contain essential vitamins and minerals, though each food contains a distinct micronutrient composition. Chicken breast contains high levels of niacin, providing 65 percent of the recommended daily intake. Tuna, on the other hand, serves as a very rich source of vitamin A, a nutrient essential to your visual system. Both foods contain a number of other nutrients including selenium and phosphorus.